In this truly stylish dish, the fiery harissa is balanced by the sweetness of roasted sweet potato and dates. 1. Take the lamb out of the fridge 20 minutes before cooking. For the harissa, toast the caraway seeds in a dry pan for 1 minute, until fragrant, then crush in a pestle and mortar (or spice grinder) with the sea salt, paprika, cinnamon and ras el hanout, until finely ground. Pulse in a food processor with the chillies, coriander stalks, garlic, tomato purée, olive oil and lemon zest and juice, until almost smooth but with a little texture; chill until needed. 2. Preheat the oven to 190 ̊C, gas mark 5. Pat the lamb dry on kitchen paper, season and brush with the olive oil. Heat an ovenproof griddle or heavy-based frying pan over a high heat, and once smoking hot, add the racks, flat-side down. Cook for 2-3 minutes, until seared, then flip over and brush the cooked side with the harissa paste. Leave for 2-3 minutes, flip and brush again, then cook for a final minute on each side, before searing the short ends for 2 minutes. Put the pan in the oven and roast the lamb until cooked to your liking – about 8-10 minutes for medium-rare; rest under foil for at least 10 minutes. 3. 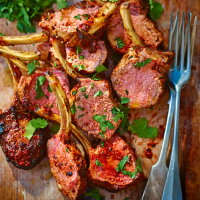 Slice the lamb and serve on plates or a large platter, scattering over the parsley and coriander leaves, with the Moroccan roast sweet potato alongside.